Halit is an inflammatory disease with a lesion of the mucous membrane and red lip rim. Different types of cheilitis are similar in symptoms. But they are different in origin. Therefore, appropriate treatment is required. The causes of inflammation of the lips can be pathologies of the oral cavity, metabolic disorders. Also allergic reactions, streptococcal, staphylococcal and fungal infections. The red rim, the mucous membrane and the skin of the lips can be involved in the pathological process with many dermatoses, erythematosis, red flat lice, psoriasis, tuberculosis, syphilis, etc. 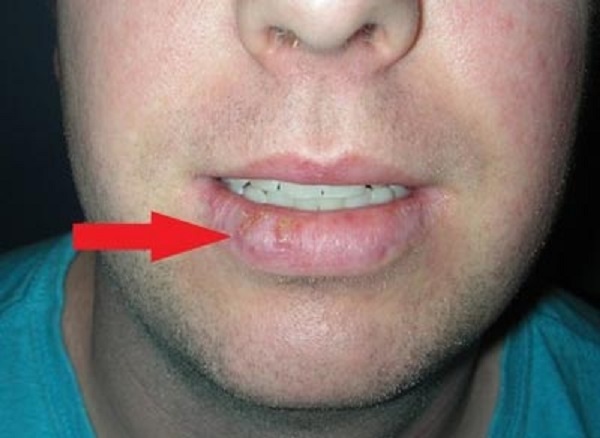 Most often, cheilitis has a chronic course with improvements and relapses. With the defeat of the red border, the lips are distinguished by a dry and moist form. With dry cheilitis whitish scales are formed. They resemble mica. Under them is a dry reddened surface. Patients are concerned about dry lips, burning. They can last for months and years. With a wet form, the permeability of capillaries sharply increases. The red border of the lips swells. It forms a large number of purulent crusts. Disturbed pronounced soreness. Difficulty in talking and eating. For the treatment of cheilitis various anti-inflammatory ointments, laser therapy, hormonal preparations and vitamins, means for correction of the immune system are used. If necessary, sanitation of the oral cavity, consultation of a neurologist, endocrinologist. !! All chronic forms of cheilitis, cracks and erosion of the lips require timely treatment to prevent the development of precancerous diseases and malignant tumors developing from the epithelium of the red lip rim. Heilit can be successfully cured with the help of external and internal application of medicinal plants. • Take even the grass of the yarrow, the horsetail of the field, the chernobylnik and the bark of the willow white. Cook and apply the same. • 1 tbsp. a spoonful of the mixture in equal parts of the roots of the blood-groove, the aura of the marsh and the oak bark. Pour 0.5 liters of water. Boil. Cook for 15 minutes. Then add 1 tbsp. a spoon (with a slide) of a mixture in equal parts from St. John’s wort, a pharmacy and Ivan tea. Insist 30 minutes. Strain. Use for repeated lubrication of lips and rinses. • Also externally, cheilitis is treated with greasing with fresh juice, cleaning large (hare cabbage), plantain juice, calanchoe, nettle, parsley. 4 hours. Strain. Drink half a glass 3-4 times a day before meals. • Nettle nettle leaves, white willow bark, creeper roots creeping, herbs asparagus, chicory ordinary, dandelion roots medicinal — equally. Preparation and use of infusion is the same. Courses for 2-3 weeks. Break 1 week (2-4 courses if necessary).